A friend recently posted an article from the Spokane Spokesman about a family who set out for a short, easy hike in the Columbia River Gorge, then suddenly found themselves trapped by fire and forced to shelter overnight. More than 100 other hikers joined them, most of whom had few if any supplies. The family said they’d never again be unprepared for a hike. Stories like this are always a great lesson and reminder that it could happen to you too. It’s easy to step out for a quick hike or run and think “I’m only going a few miles, I don’t really need anything.” But you never know what may happen out there, even on a short hike! 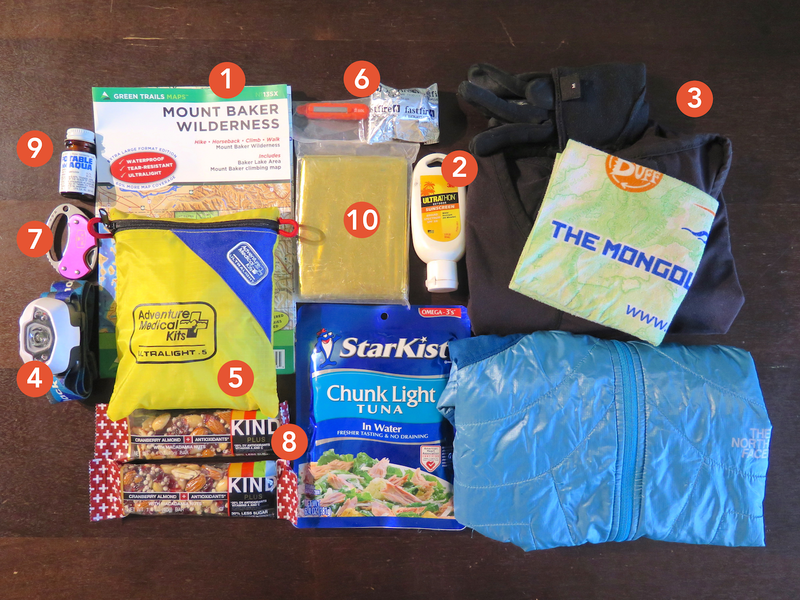 No matter the season, whenever you hit the trail, you should ask yourself how prepared you are to spend the night if the unexpected happens, even just a mile or two from the trailhead. I know safety gear can be a topic of debate on many forums. Some say the 10 essentials are too many and carry only a subset of them, others say they’re a must have. For me, especially since I do a lot of solo outings, I err on the side of having a bit too much than far too little. I’ve been on a few adventures with underprepared friends where things didn’t go quite as planned and suddenly my extra food and supplies made me their favorite person! I’m a strong believer that carrying the 10 essentials is the smartest and easiest thing to do for most people going outside. Carrying them doesn’t add much weight or space and can make a world of difference when the unexpected happens. Proof that you don’t need a big pack to carry emergency items. Everything I list below fits into my tiny 3L Cotopaxi Veloz trail running pack with room to spare! Below is an overview of the minimum amount of supplies I carry that complete the 10 essentials. Again, this is a minimum. I supplement quite a bit depending on weather, distance, and destination. But even for short runs, I always carry this base level of gear. 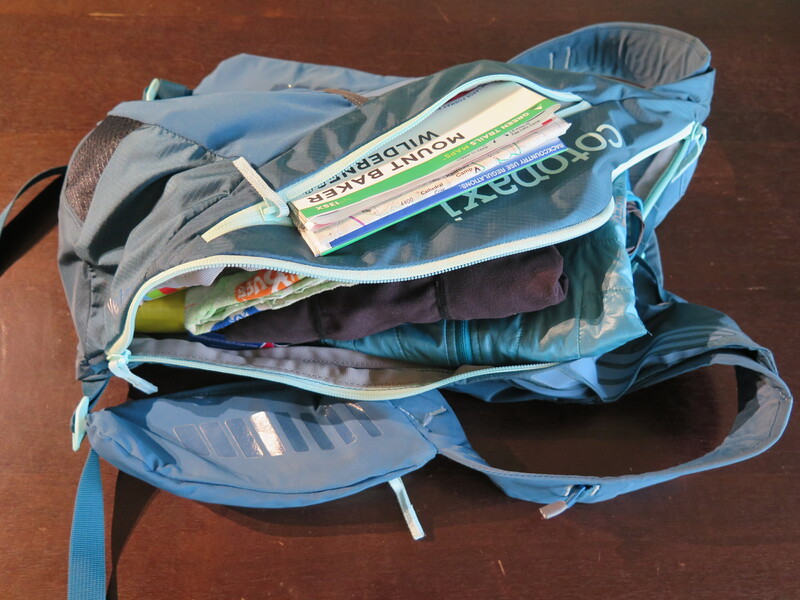 Everything in the photo (including the extra clothing) weighs in at 2 pounds and easily fits inside the smallest trail running pack I have, my 3L Cotopaxi Veloz hydration pack. These are the minimum items I carry on nearly every adventure. They satisfy the 10 essentials and give me a buffer for safety if the unexpected happens. Navigation. I have some iPhone GPS apps but I still carry a hardcopy map of where I’m going 95% of the time. I’m an old-school map lover and I simply enjoy being able to open up a map vs. scrolling around on a phone. Sun protection. A small tube is sufficient and remember that even in winter, you can get a nasty sunburn from the snow! Insulation. The extra clothing I pack varies by season, but at minimum I bring a long-sleeve wicking shirt, insulating vest, light gloves and my Buff. My North Face vest is light, small, and made of PrimaLoft, which means it’s incredibly warm, even when wet. I have a lot of trouble with my hands getting cold, so I never leave home without a pair of gloves. My Buff is so versatile that it goes with me everywhere. In the winter I switch out my lightweight Buff for my warm fleecy one and bring a larger pack that can fit a puffy, thermal tights, and warmer gloves. First-aid supplies. I carry a small basic kit, supplemented with Benadryl. Remember to restock as you use it! Fire. I fit a SOLKOA FastFire cube and a SOL Fire Light Fire Starter into my first aid kit. The little starter will spark easily using one hand and a single FastFire cube produces a wind resistant flame that will ignite, even when wet. A whole cube will burn 10-12 minutes or can be cut into smaller pieces. Repair kit and tools. I keep it simple and bring a small pocket knife. Nutrition. My ideas of nutrition vary vastly from others, that’s for sure! Going hungry is never on my agenda, especially since I’m a person who can have trouble with my blood sugar. I generally have at least two bars with me and pick something with substantial calories. Some folks laugh at the tuna pack I always carry, but tuna is high protein and if you hike with your dog, it can double as food for both of you! Hydration. If I use my larger Salomon pack or day hiking pack, I often bring an MSR gravity filter, but at the very minimum, I bring some iodine tablets. Two tablets will treat a quart of water and though it might not taste the best, in an emergency, they’re a must if you don’t have anything else. Emergency shelter. My first aid kit contains a one-time use emergency blanket. Also consider an emergency bivy, they’re super small and worth the investment! Bonus item: whistle! Every one of my packs has a whistle tied to it. If you’re ever stuck somewhere and need to get the attention of other hikers or rescuers, a whistle can carry for over a mile while the human voice is generally only discernible for a few hundred yards. The universal distress call is three short blasts. Bonus item: personal locator beacon. I do a lot of solo outings, so I bring a SPOT tracker with me and make sure someone knows my itinerary, my expected date and time to return, and the URL to see my SPOT tracker data. If an emergency happens, I rest easier knowing I have a way to signal for help and that others know where to find me. Don’t forget to also think about the emergency supplies in your vehicle. I’m sure everyone remembers my crazy outing to Goldmyer Hot Springs where myself and a few friends were stranded for two days due to washed out roads. I was very thankful my Jeep was stocked! Being prepared and carrying a few ounces of extras increases your safety margin and can make a difference between life and death when the unexpected happens. Being able to help yourself also makes rescuers jobs easier and safer! If you don’t regularly bring some type of emergency gear with you, consider doing so. Even if you’re not the one who uses it, you never know when you may come across someone else on the trail who may have an emergency and need help. The more all of us are prepared, the better the outcome for everyone! What types of emergency gear do you bring with you?